Zipper replacements for NFPA zip-up fire and EMS boots are independent of the boot and help to provide a customized fit. Easily adjust the fit of your boot by loosening the laces on each side of the zipper, closing the zipper, then tightening the laces for a secure but comfortable fit. Helpful hint: If zipper grips become stuck, they can be released easily using a few drops of silicone or sewing machine oil. Also, don't forget to add the cable tie between the bottom two eyelets! This helps stabilize the zipper and avoids uncomfortable deformation that can occur in the toe flex. Boot zipper replacements are available for Airpower® XR1, Airpower® XR2, Airpower® XR2 Winter, Airpower® R2, and Fire Flash® Xtreme. Sold individually. If you need to replace the zipper in each of your boots, please order 2. Instructions on how to replace work boot zippers are included. You can also watch our easy step-by-step instructional video above. Related links to "HAIX Zipper"
Customer reviews for "HAIX Zipper"
Love the boots but constant zipper issues. It could be they get caught on the leather or they won’t stay up with the Velcro and the other day one broke off. Questioning myself as to what to do. Thank you for your feedback on the Airpower XR1. We are happy to hear that you love the boots, but we apologize you have had some issues with the zippers. After reaching out to you via email, I believe we have found a reasonable solution to the problem. We certainly hope this will not deter you from considering HAIX again in the future. These are my first pair of Haix R1 boots. I work for a local fire department and have wore these a little over a year now. Both of the zippers on broke off so I had to use zip ties so I could grab on to something to zip it up. I have also had the common issue of the zipper not coming down because it gets stuck on the leather piece underneath. Totally defeats the purpose of having zippers on boots if it slows you down. Hopefully Haix has fixed this defective part, otherwise, the boots would’ve been flawless. We appreciate your feedback on the Airpower R1. We apologize that you have had issues with the zippers, I can see where this can be cosly when going out on a run. After reaching out to you directly, I am confident that we have found a reasonable solution to the problem. 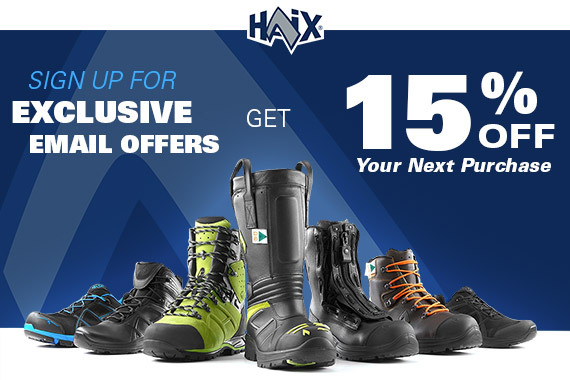 I hope this will not deter you from considering HAIX for your footwear needs in the future. Stay safe out there! The boots are very comfortable but the zippers are horrible. They constantly get stuck. One now won’t completely unzip and the other the tab on the zipper broke from constantly tugging on it. We appreciate you taking the time to submit your feedback. We are happy that you like the comfort and feel of the boots. We apologize that you have had so many issues with the zippers but, after speaking with you, I am confident we found a reasonable solution to your problem. We certainly hope this won't deter you from considering HAIX again in the future. Stay safe out there! I just bought the airpower xr1. I'm a firefighter and the benefit of getting these off and on quickly was a big part of the reason I purchased them. The boots are very comfortable and not near as heavy as some have complained about. But the zipper is horrible. I am on my second shift with them and they will not pull all the way down. There is a leather flap behind the zipper that constantly gets stuck in the path. Today cost me 3 minutes when I needed to get into my bunker gear because my boot was stuck on. 2 shifts and I'm having problems. I haven't even had the opportunity to mail in the warranty card. Very disappointing design flaw for a 300 dollar boot. If I cant get them off quickly they have just become a 300 dollar pair of paperweights. I'm very disappointed in this. It's a comfortable boot, but with the zipper flaw it is not practical for wear for a station boot for a structural firefighter/ EMS role. Thank you for giving us feedback on the Airpower XR1. We are happy to hear that overall you found the boot to be good especially when it comes to comfort. We apologize that you are having so many issues with the zipper making it hard to get the boot off/on in a timely manner. After reaching out to you via email, I am confident we found a reasonable solution to your problem. I hope you won't let this deter you from considering HAIX again in the future. I love the boots. They are very comfortable, stay in excellent condition and last a long time. I only wish I could say the same for the poor quality in zippers. BOTH of my zippers have failed recently and broken within the past two days, in less than a year of owning the boots. I would like someone to contact me in order to get both replaced for free since its within my year warranty. I've called and left messages, without return thus far. Thank you. Thank you for taking the time to give us feedback on the Airpower XR1. We are happy to here that the boots are comfortable and durable. This issue would definitely be covered under warranty as a manufacturer defect since you have had the boots less than a year. I apologize that no one got back to you sooner, but after being in contact with you I am confident that we found a reasonable solution to the problem. We certainly hope this won't deter you from being a loyal HAIX customer in the future. Great bots but I was having the same issue with the zippers as the reviews above me. Solved it by trimming the leather from the zipper path with a pair of scissors and taking the velcro off from the front side. Really not that big of an issue. Thank you for taking the time to give us feedback on the zippers. We apologize that you have had issues. After reaching out via email, I am confident that we are both happy with the resolution to this problem. We hope you'll continue to be a loyal HAIX customer in the future. Stay safe out there! I have owned my xr1's and they are great I love them but recently I was going to a call and went to zip my boots and the top of the zipper and the zipper leash all broke off . I was forced to run the rest of the call with a half zipped boot was not to happy about that . Is there any way to fix this issue due to I can't rig anything up to be able to zip them up. Thank you for taking time to review the Airpower XR1. We are glad that you find them to be great boots on the job. We sincerely apologize that your zippers broke while out on a call, but we feel that this issue has been resolved to your satisfaction and hope you will continue to be a loyal HAIX customer in the future. Stay safe out there! I have had my HAIX fire boots for a couple years. They are very comfortable and I can wear them all day. They are a little harder to get on and off but other wise I really like them. The zippers do get caught some times and last week the zipper pull broke. I made a make shift fix but need to get it replaced. Thank you for taking the time to review our boots. We are happy to hear that you found them comfortable on the job. We have since been in contact with you and feel that we found a reasonable solution to the zipper problem. We hope these boots continue to serve you well in the future. Stay safe! Hey guys, Im am currently in a Fire academy and I have been issued the Haix Airpower XR1's. I love the boots they are very comfortable but unfortunately after just 3 months the zipper keeps getting stuck. I have tried everything and in emergency drills, I am unable to get the boots off in time. This is a serious issue. Please advise of what we can do about this? I would really appreciate if I can get another set of zippers send out. We appreciate you taking the time to share your experience with us about the Airpower XR1. We are sorry to hear about your issues with the zippers. We have emailed you about the problem and hope to help you get it resolved soon. But overall, we are happy to hear that you like the boot and find it to be comfortable during training. I love the fit of my Haix boots and after 25 years in the fire service, they are my favorite fitting and light weight boot. The only negative is the zipper that is stuck half way. I removed the zipper and fixed it as it is catching on the leather backing but within one shift it is once again stuck and makes getting in and out for emergencies a problem. Not sure what the fix is but I'm not too eager to drop $30 on another set of zippers after only owning for 7 months. Thanks for your feedback. We are sorry to hear about your zippers getting stuck. We would be happy to send you a replacement. Do you need one zipper or two? Please send us your shipping address and the exact style of boot you are currently wearing. We hope this fixes the problem. I have had my boots for 2 1/2 years now. I just replaced my zippers on my Haix boots. Very easy to install these zippers on the boots. We're happy to hear that you have gotten solid wear out of your HAIX boots and that the new zipper was easy to install. We appreciate your feedback and hope you'll continue to be a customer in the future. I have had my Haix boots for 7 years. I have to say that I love them. I use them for EMS duty and motorcycle riding. Sadly I yanked the zipper to hard and pulled the pull right off. After spending the weekend pulling the zipper up with my Leatherman, I contact Haix and they sent the replacement. How do you rate a zipper? Anyway most importantly, the boots are back in service! Glad we could get you back in service, and on the road! Thanks Lee! Zippers should last more than 6 months. Customer service did not understand that I purchased new boots a year ago and have replaced the zippers three times now. I understand wear items, but I work a 7 on 7 off schedule and only wear these R7 at work. If your going to cheapen up the product you can cheapen the price. Still upset by customer service stating only that the boots were out of warrenty. I get that but the new part failed at only 6 months. I was stuck in my boots and had to cut the laces to get out of them. Not sure if I'll even but another pair of Haix Boots due to this. Almost a hundred Dollars every time the zipper breaks and new laces. Thanks A lot. We’re sorry to hear about the issue with your zippers. HAIX regular stock boots have a one year warranty against manufacture defects, this includes the zippers and laces. Our customer service department is working with you to get this resolved. There is a major flaw in the XR1 zippers. It's possible it's only on the women's airpower XR1, which are what I am referring to in this review. The tabs on the top allow for too much movement, no matter how tight, not allowing the zipper to go down without having to hold the tabs. If you are able to zip them up all the way the leather backing on the zipper gets caught in the zipper and they won't unzip all the way. I have tried to loosen and tighten them in every way and new problems reveal themselves. The Velcro doesn't remotely hold up the zipper, so the zipper constantly falls down to half, even if the leather is stuck in the zipper. I have had a lot of boots with zippers in my 16 years in fire and EMS and never had problems like this. I even previously had the R2s and the zippers worked well. We’re sorry to hear about the issue with your zippers. HAIX regular stock boots have a one year warranty against manufacture defects, this includes the zippers and laces. Please feel free to contact us at 866-344-4249 and speak to our customer service department so that we can help to get this resolved for you. I'm sorry to hear about your zipper issues. I believe customer service is in contact with you now, working to resolve this issue.